I have the most amazing houseguest right now. 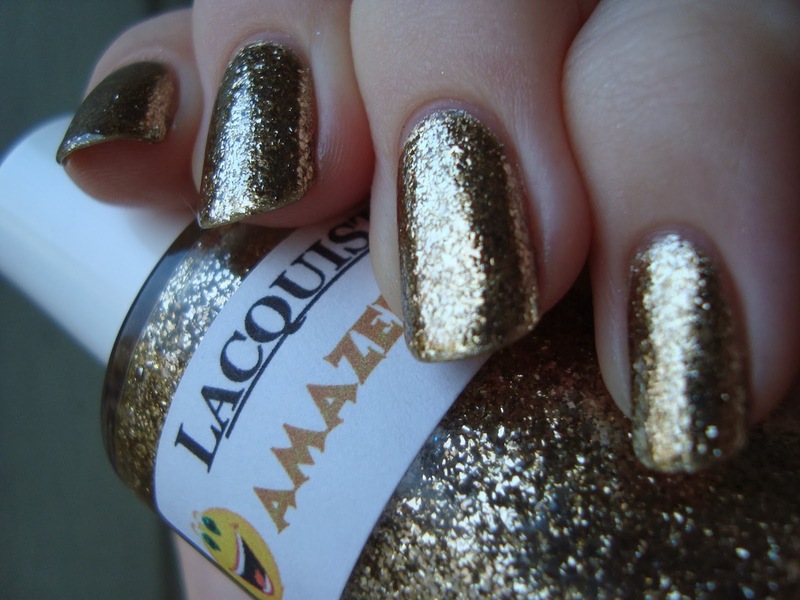 My buddy McGee moved recently and sent her bottle of Lacquistry Amazeballz to me for safe keeping while she settles in. I get to keep a decant too, since that was what she'd originally planned to send. I remember how giddy she was when she got it. A full ounce! This thing is a wonder to even just look at. Huge and glowing! Jenna, Lacquistry's owner, has placed her Etsy shop on vacation, so Amazeballz isn't currently available and I'm unsure of the price. It's a really tough one to photograph, since it's so...well...amazing. I got a blurry-ish phone video of it that shows how crazy reflective it can be. You can kinda see yourself in it, it's that shiny, and I spent way too much time over the past couple of days watching it reflect various things and just wiggling my fingers around in front of myself and others. Amazeballz has very large metallic flecks in a clear base. I've seen a ton of photos of Amazeballz by now, so I knew before it even showed up that I'd be layering it. Sure, it can be worn on its own, but it's a borrowed bottle and I wanted to hide my nail line completely. 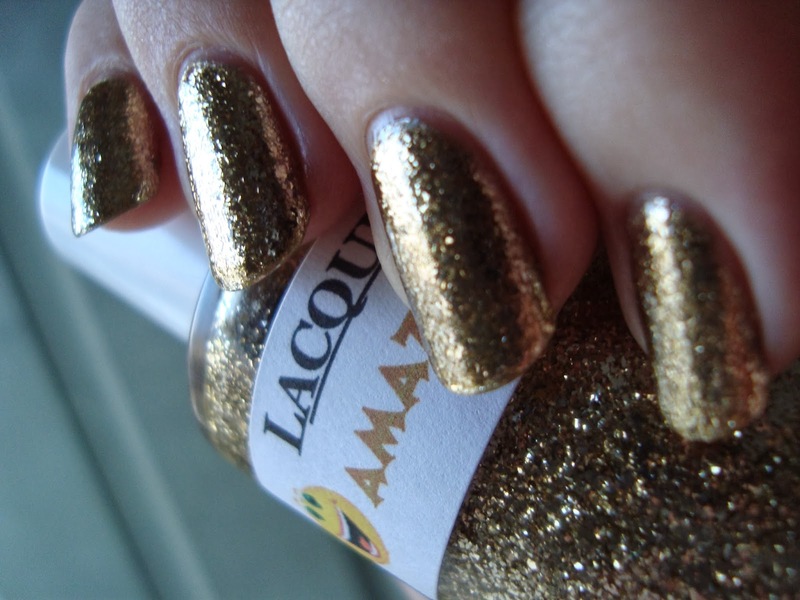 I chose OPI Glitzerland because I've seen how the base color can really affect the way it looks. 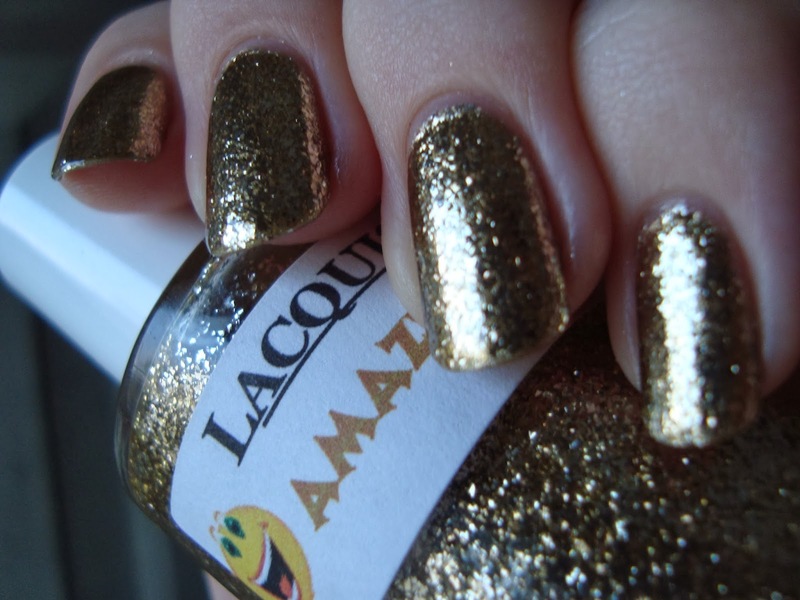 Glitzerland is just about perfect as golds go. 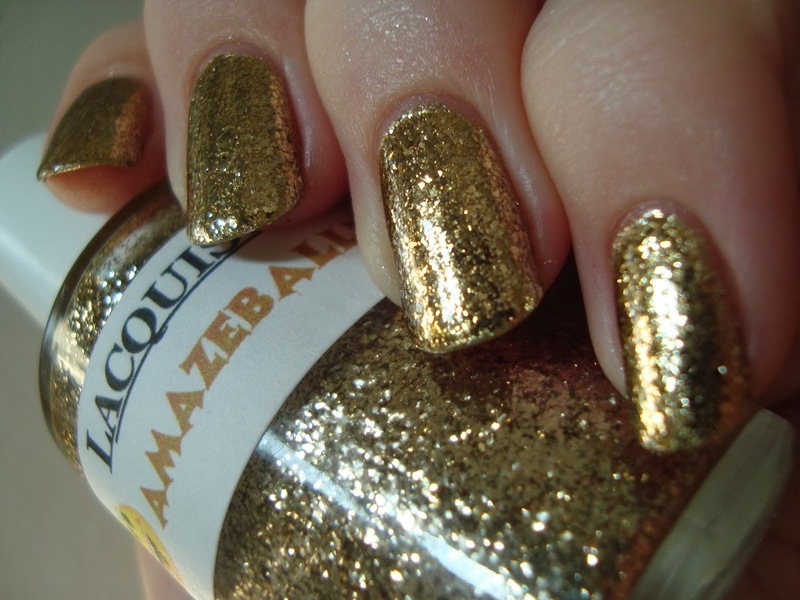 This is two coats of Amazeballz over two coats of Glitzerland. Application was fine. The only thing that bothered me is that you really can't wrap your tips with it. The flecks are just way too big for that. It's another reason I used a gold base, since I don't like bare tips. It's mindblowing, it really is. Notice how you can see reflections of the other fingers? It reflects anything and everything it can. I caught myself looking at it while driving in the dark, since it catches every streetlight. I waved it in front of my partner's face, and even he admitted that it's crazily shiny. See my camera on the ring and pinkie nails? 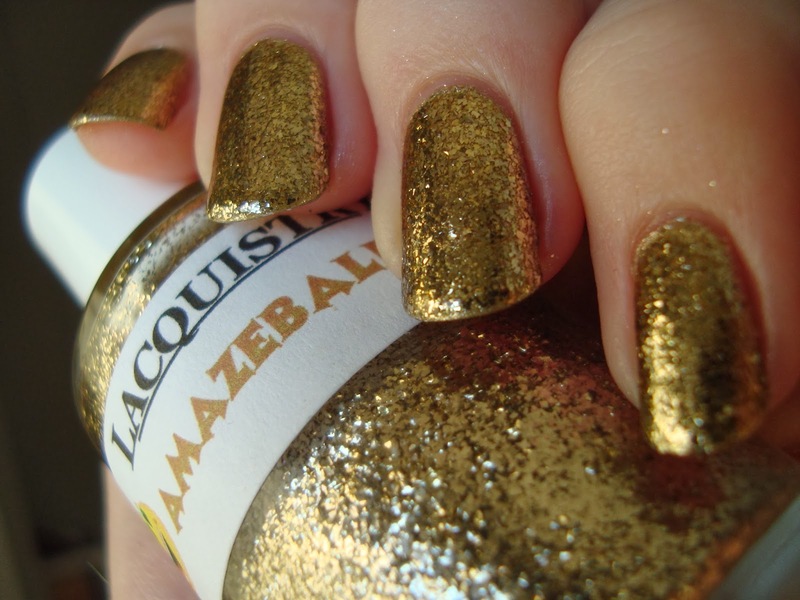 Amazeballz is the most reflective non-chrome polish I've ever seen. It looks like a foil, it's that intense! The flecks are gold, but just how gold varies with the lighting. It can vary with the base too, from what I've seen in others' photos. I may have to fiddle around with layering it sometime. See my right hand reflected on the pinkie? Insanity! Pure gorgeous, hypnotic insanity! I took a TON of photos, so...here are a bunch more. I can't think of enough to say about how cool this stuff is! Bottom line: I really hope Jenna and Amazeballz both come back! I might wind up buying a bottle for myself. A decant might not be enough! I got several compliments on this mani while out shopping. Sales people and cashiers rarely ever even notice my nails unless I'm buying polish, but Amazeballz is unmissably eyecatching. What's your most complimented polish? Thanks! :D It's way more impressive in person though! I really hope she makes more. 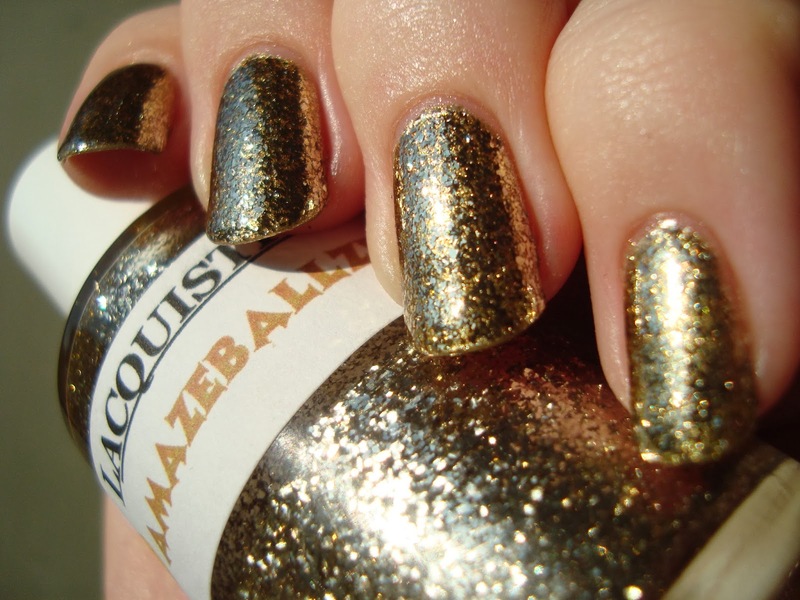 I wonder if this is just a tiny-glitter version of that milani? Which? The flecks in this are pretty big.